So, let me get this straight, you do receive a lower cost to operate when you outsource, but face a challenge to sustain it? That's a little strange, because when we spoke with 50 of the largest enterprises across the US, Europe and Australia recently, they all outsourced IT to save a lot of money, and the majority were looking aggressively at increasing their outsource scope to find further savings, while others were pretty content with the status quo. Noone felt their firm hadn't benefited financially from the exercise, and those that had initial teething problems had largely got on top of them. And most of them actually liked the value and the access to specific software expertise they received from some of their providers - and their only real complaint was that they wanted more. wow. am amazed she actually said that. where's she been all decade? What is she talking about? The whole IT outsourcing business has been built up by firms saving money on IT support work, and accessing a critical mass of expertise that they cannot hire organically. It's not ONLY about saving money, but it's also about accessing expertise and resources they DO NOT have! She's missing reality on both counts. Kudos to you, Phil for highlighting this. Phil - Would it be possible to share clear evidence of financial gains that companies have achieved over the last decade through outsoyurcing BPO, IM and AM. Great question and I am sure one which is nigh on impossible to answer given the interdependencies / multiple influences on cost bases. Not clear to me how anyone, Gartner or HFS, can make an unequivocal argument one way or the other. Good to see someone rocking the boat though! As I once heard a Big Deal salesman state - Its only a number on a spreadsheet. How difficult can it be to make this work? @Vinod - the whole IM and AM business has been centered on cost-savings as the entry-lever for clients, largely through labor savings (initially), but has become driven also by the sheer shortfall in availability for services personnel needed to scale-up and down on projects etc. Pop me an email for some data points on proven cost-savings across IT and business process-type: phil dot fersht @hfsresearch.com. However, most telling is the metric we just provided (see post) showing existing IM and AM clients overwhelmingly seeking to increase scope in current engagements: the ultimate proof-point for longer term value. I will confess much of that "value" is determined by cost-savings, but if that is how business leaders want to run IT in their company, then that is their metric of choice. 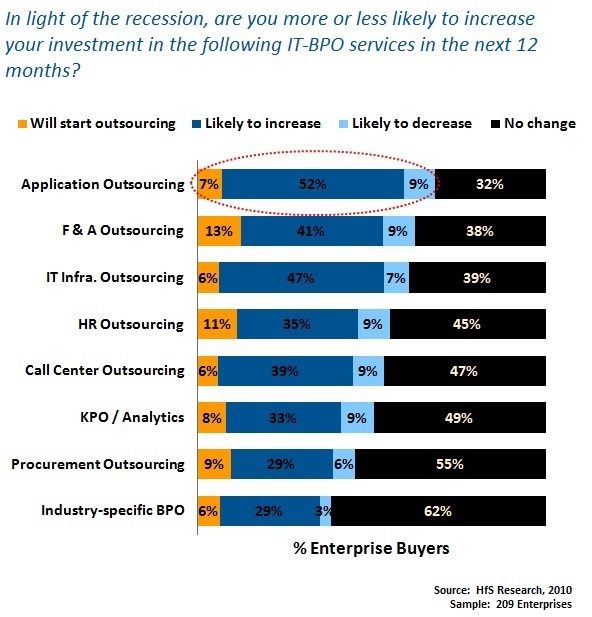 Regarding BPO (which is not the focus of this article), the current "deal-value" is more centered on wage-arbitrage than expertise-value with the majority of deals, but that is just a symptom of the immaturity of the BPO market - and the industry needs more time to get better ROI feedback from clients - even though it is clearly moving in a similar direction to ITO in terms of longer-term project "value", based on the data we are presenting for clients wanting increased scope in areas such as F&A and procurement (and even HR!). You can access some F&A BPO case studies here. @James - Thank you for the comment. I am sure there must be researched eveidence that can substantiate either side of the arguement. That is what i am seeking. @Phil - Thank you for elaborating. I have read through the reaserch paper with the case studies on an earlier instance and can understand the benefits each of the clients of the providers mentioned in the paper have validated. I agree with your view that in BPO - cost arbitrage is one of the key drivers and outcomes of the exercise and then comes value during the course of the contract. I will connect with you on mail for the data points as you have sugegsted. Outsourcing has been an innovation killer. While the act of outsourcing certainly gives cost saving, it is generally seen that those processes which should have been eliminated by simple innovations continue to happen just because they are being done at a low cost and need not be reviewed. Over years, innovations can bring big benefits to business processes, but it seems the breed of innovators have been also outsourced. @Alok: I think you're talking more about outsourcing causing automation of processes not to happen. Not sure I fully agree, when you consider most IT processes outsourced are more routine maintenance / support and programming work. The most automatable area is help desk, and I think most people perfer to have a live support rep when they need one, as opposed to automated online support being forced on them! I would agree that some companies can neglect "transforming" old processes when they are in an outsourced state, but I would also argue that more companies would not have "transformed" them in any case if they had kept them inhouse - most IT personnel, particuarly those in under-resourced organizations, do not spend a lot of time in training programs to learn new ways of developing code, or new ways to approach process workflows. I would argue that the outsourcing providers are more motivated to look to "innovate" where it enables them to deliver services to clients with less resources. Moreover, the outsourcing process does provide a "change agent" to do things differently, however, this is 100% dependent on the attitude and application of the company doing the outsourcing, provisions in the contract to allow for "innovation delights", and the capability of the provider to provision a team capable of working effectively with the client. “First of all bother to have a strategy, bother to sit down with the business operators…and plan for the way you will resource moving forward." "Outsourcing problems are being caused by Middle management." So, make a business plan, have your CIO manage the entire process and while he/she is at it..try and find new technology that will enhance your business model....but don't outsource it because the cost savings are not sustainable. (????) Good times. Could it be that with EDS, Perot Systems, ACS now working for manufacturing companies, they have rduced their considerable spending with Gartner to promote outsourcing? Just asking. Having been on the receiving end of a number of outsourcing initiatives sounds feasible to me. History is generally written by the supposed winners, i.e. the consultants who have a vested interest in making sure the figures look good or the management that sponsored the initiatives in the first place. Nice to have a perspective from a credible source who doesn't have a vested interest. Her representations are ludicrous, at best, if being quoted here in context. First of all, Gartner has issued innumerable reports showing the supreme efficacy of outsourcing. It is clear that The vast majority of successful first movers, best in show and stellar performers in their respective business industries have found that the definitive answer to success in cost reduction and quality performance enhancement in their business models has been through outsourcing their non-core competencies. The key, these companies have found, is that they outsource their non-core competencies such as their back office work (A/P, A/R, Customer Service, Internet and telephony response-inbound, inbound/outbound sales, procurement, H/R, etc.) so that they can more effectively maximize their focus on their core competencies. They have achieved major benefits not only in capital cost savings but also in flexibility, scalability and even consultative improvements from experienced and reputable outsourcing providers. Moreover, most of these companies are also pleasantly surprised to discover that the quality of the outsourced services do not suffer in terms of quality but, rather, that the quality and efficiency levels of the services they provide are, in fact, enhanced- a benefit that inures to the benefit of their client/customers. We have multiple Case Studies, informative white papers and further information definitively demonstrating how the benefits of outsourcing are clearly extant at http://www.PremierBPO.com. @Phil : I have different opinion on third party vendor being motivated to innovate just because they can do with lesser resources. Certainly, the vendors are capable of innovating, but it is rarely done except in fixed cost projects without being specifically pushed for by the customer. The process of innovation for the customer goes against the interest of the vendor as this impacts their future business and revenues. I am facing this sitiuation often where we find complexities build in by the vendor just to ensure that more people are required to support the application at a later date and no one else understands the work done by them. This may sound unreal, but this is something we encounter very often. I am running a Captive IT company in India for a US giant and is responsible for transfering back outsourced work to the company and have practical experience to believe that things are not as staight forward as they appear. Wow, I work for an IT services outsourcing major out of India. If outsourcing does not save the client money, why am I paid the rather small bag of peanuts every month? Phil, I thank you, glad to know I and my rather small bags contribute to the well being of many global enterprises. @outsourcing employee: you can be rest assured that many global enterprises are so appreciative of you and your peers' work, they are hungry for more... and more... and more of it. Just look at the double digit growth rates of all the leading providers - in addition to the HfS demand data analysis. To say outsourcing "didn't save money" is lunacy. However, the longer term challenge is for enterprises to demonstrate true value from their IT in general, which includes all "outsourced" elements. Hence, IT can he ultimately held accountable to not delivering "value" in many organizations, but accusing outsourcing of "not saving money" is incorrect. To add to this, if IT, for whatever reason, isn't really adding a whole load of value to a client and is merely being utlized for "keeping the lights on", then - by all means - run it as cost efficiently as you can!